This is an important update on some of the important battles that Gun Owners of America is fighting right now. 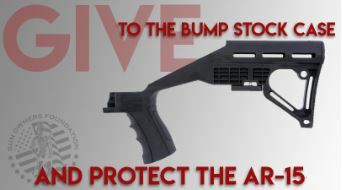 We are still awaiting a decision on GOA’s court case involving bump stocks. We had hoped to get a decision by last week. But since we have not, GOA today filed an emergency petition and motion in the U.S. Court of Appeals for the Sixth Circuit. In it, we are asking the Court of Appeals to order the district court to halt ATF’s regulation until the court issues its decision on our pending motion. Also, we separately asked the Court of Appeals to stay the regulation until any appeal is heard — a stay that could hopefully last weeks or months while we make our case as to why the ATF ban is illegal. You can read an analysis of the hearing that took place earlier this month before the district court here. As you will remember, this is a very important case since it will ultimately protect us from seeing a future president use these regs to ban AR-15s. We will keep you updated over the next week with progress reports on these latest efforts by GOA’s legal team. As if there weren’t enough gun battles to fight in this country, the media is now trying to use a horrible tragedy abroad as an excuse for more gun control here. The Daily Caller is running my opinion editorial today, detailing the misinformation and misreporting that the media is circulating in the aftermath of what happened in New Zealand. New Zealand has far greater gun control than we have in the United States. More gun control has not made people any safer. The killer broke off the attack, only after being confronted with a weapon. It’s not your typical “good guy with a gun” story, but lives were still saved — and few outlets have mentioned it. There is documented evidence that media reporting on mass shootings has actually fueled great anger and mayhem and … death. On this last point, how convenient that the media avoids any accountability by shifting the focus away from themselves and, instead, are calling for Second Amendment restrictions. Several media outlets are falsely claiming that Australia’s gun confiscation lowered crime rates and stopped mass shootings from occurring. And they make these claims, hoping to gin up support for a ban on commonly-owned firearms here. But both of these assertions are false, as the Daily Caller article shows. One thing is for sure, however. Given that New Zealand already registers semi-automatic firearms, officials will now have a target list which they can turn into a gun confiscation list. And just as gun confiscation failed to stop mass killings and mass shootings in Australia, it will most certainly not make the people any safer in New Zealand. Both of these countries are reminders that the anti-gun Left will keep pushing for gun control until they get their desired goal — gun confiscation. That is why we cannot compromise. And here at Gun Owners of America, we will not compromise. Thanks so much for standing with us. Don’t Let Gun Confiscation Come to Colorado!